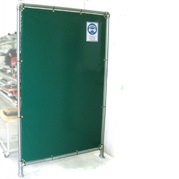 Covertex manufacture a range of PVC screen systems to suit a variety of industrial applications. 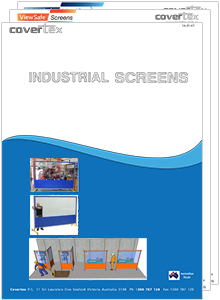 Screens are supplied in a range of standard sizes or can alternatively be customised to suit specific requirements. Our PVC screens are a practical option for many diverse applications including wash bays, climate control areas, spray booths, welding bays, clean rooms, machine safety barriers and as dividing screens in factory / warehouse buildings. Covertex ViewSafe Screens help guard your workplace against contaminants & equipment hazards common to manufacturing environments. 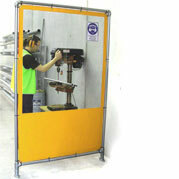 Particular applications include machine room & work centre dividers. 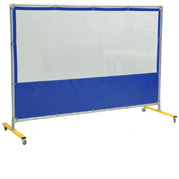 Covertex ViewSafe Maxi Screens provide an effective means of protecting personnel & equipment in the workplace. Common applications include factory workcentre dividers & washdown areas. 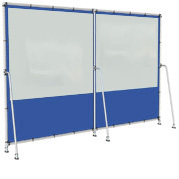 Covertex ViewSafe Mobile Screens provide an effective means of protecting personnel & equipment in the workplace. Common applications include factory workcentre dividers & washdown areas. Covertex BlockOut Screens help guard your workplace against common hazards found in processing environments. Typical applications include Grinding / Splash Areas & Privacy Dividers for Workcentres.